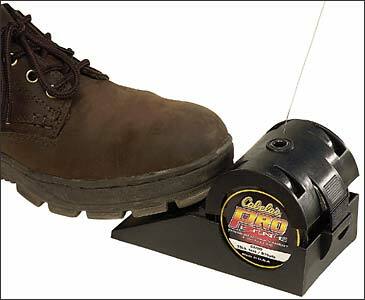 A Made in USA product that allows the angler to spool in line by himself anywhere, anytime. Just drop in the line, push it through the ceramic hole and you are ready to spool in at whatever tension you desire. Available in two types: Spool It I, for 1/4 pounder and Spool It 2 for filler spools. Can take up to three spools at a time. Available at Petmart Pte Ltd.Tel: 62896471. Fish Alert. Device gives a beeping sound and flashing light when the fish bites. Made in Australia.